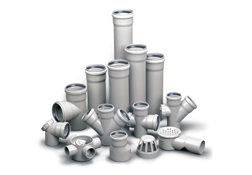 Precision Sewerage Waste Rainwater (SWR) Pipes & Fittings are manufactured from a specially Formulated unplasticised polyvinyl chloride compound. These pipes & fittings are tough and durable with high tensile and impact strength and are manufactured in accordance to IS: 13592 – 1992 & fittings to IS: 14735 – 1999. Rubber rings confirm to IS:5382. Precision Sewerage Waste Rainwater (SWR) Pipes / Fittings are available with ‘O’ ring joint for quick, efficient & Leak free Waste Discharge systems for Homes, Apartments, Hotels, Commercial Complex, Hospitals etc. Type A : For Rain Water Discharge. Type B : For Soil & Waste Discharge. • High quality • Time tested Operational life of 50 years • Economical Low Maintenance, Quick & Easy Installation • UV stabilized Weather Proof • Corrosion & Chemical resistance • Easy Flow due to smooth inner surface • Hygienic & Environment friendly • Easy access for cleaning and clearing obstructions.